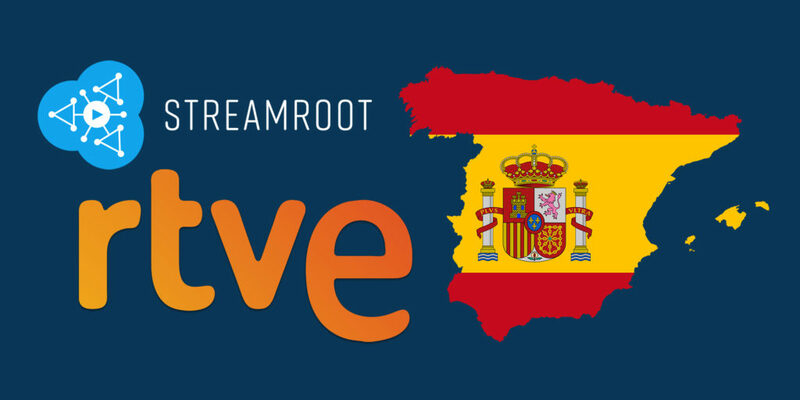 Streamroot, the leading provider of distributed delivery for OTT video, announced today that it was selected by Spanish public broadcaster RTVE (Radiotelevisión Española) to power VoD and live video delivery for its online video platform. RTVE, the largest audiovisual group in Spain, offers a selection of news, entertainment, sports and children’s TV channels. These include La 1, La 2, 24h, Teledeporte and Clan, as well as international television channels TVE Internacional and Star TVE, serving the Spanish-speaking world. As the national public broadcaster, RTVE broadcasts high-profile live events such as the Eurovision song contest, national lottery draws and major sporting events. Committed to quality, innovation and public service, RTVE is known for harnessing groundbreaking technology to continuously improve its audiences’ experience. To implement innovative formats and tools that redefine storytelling, including multi-screen viewing and Ultra HD, VR and interactive content, RTVE has been adopting new techniques for generating content and for modernizing its production and distribution workflows. In order to provide these bandwidth-consuming formats to growing audiences across devices and geographies, RTVE implemented Streamroot’s distributed network architecture – Streamroot DNATM – throughout its digital offerings including its live and on-demand video services. RTVE (The Corporación de Radio y Televisión Española), is Spain’s public state-owned broadcaster and the largest audiovisual group in Spain broadcasting in the Spanish language. RTVE has seven television channels, six radio stations and a digital platform, in addition to the RTVE Institute, Orchestra and Choir. As the national public broadcaster, RTVE guarantees diverse and balanced programming for all audiences with quality news, education and entertainment content. Streamroot is a leading provider of innovative OTT video optimization technologies for content publishers, network service providers and enterprise customers. Powering over 20 million video sessions every day, Streamroot’s peer-to-peer video CDN, midstream CDN switching and eCDN solutions offer improved quality of service, global reach and unique fixed-fee economics. Streamroot’s groundbreaking delivery architectures are based on open standards such as WebRTC, Media Source Extensions and HTML5, and are widely adopted by broadcasters around the world. Streamroot is DRM agnostic, plugin-free for viewers and integrates seamlessly into broadcasters’ existing workflows. Founded in 2013 in France, the company today benefits from VC funding and serves premier media groups from its Paris, New York and Denver offices.